This is a Wine & Dine Wednesday post on a Monday. It has been in my line-up and I really wanted to write about it today. Did not think you would mind. 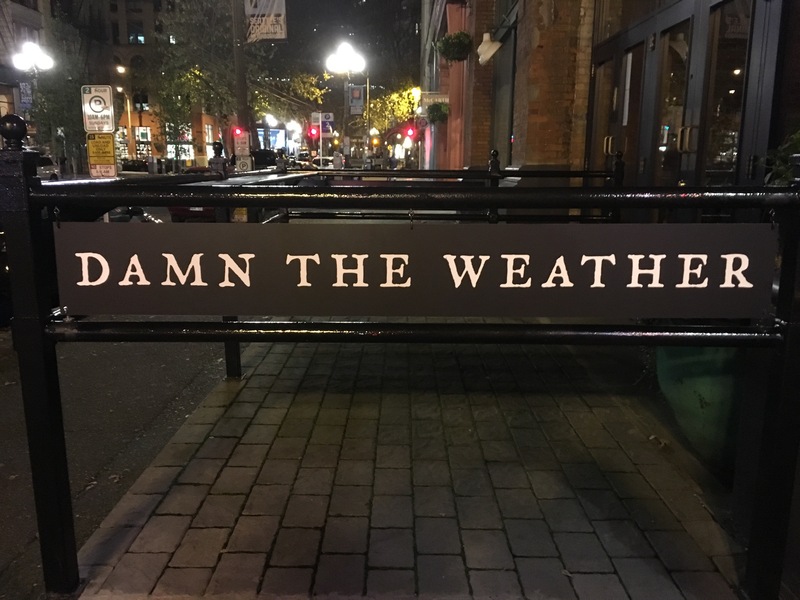 Full disclosure, Damn The Weather is a restaurant & bar owned by the husband of a WK family member, Lisa. That aside, I would have still written about it as sooooo many people have told us how fab it is and how much they enjoyed it. And they were right! Plus you know I only write about spots we adore, and this is now added to that list. We had a date night a few Sundays back and finally got to give it a go. A misty eve where the name of the place was completely apropos. Located in the historic Pioneer Square area, the space feels like you have entered into another time. A feeling that Pioneer Square evokes in spades, which you know I quite like. Drinks play a big role here, so if you are open to trying a new cocktail, you will be filled with glee. Mister Sive tried a cocktail he had not had before (so sorry I forgot to write the name of it down) and he smiling throughout the meal. Oh my stars, the meal. So good. We shared everything and relished every single bite. Here is what we had. A beet salad with whipped feta, seasonal greens, pistachios and tarragon. Roasted cauliflower with lemon ricotta and caraway bread crumbs. Chicken fat fries with fennel pollen and lemon. Ok, I was sorry we split these, as we both could have polished off an order of these. Braised short ribs with parsnip purée, chanterelles and truffle butter. Along with a grassfed beef burger with Gruyere & portobellos on a seasame bun. All stellar. And I have to tell you, it was the best burgers either one of us had ever had. That is high praise coming from this Midwest boy who was raised in a house where hamburgers were given rock star status. I can’t even tell you what we split for dessert, but it was also sublime. We were so happy. Is that what dining out is all about? They are open during the week at 11 when they start serving lunch, staying open all the way through 2 in the morning so a cozy spot to grab a bite after a concert or play. Week-ends they open at 4, again staying open late on Saturday and not quite as late on Sunday. Just a gem for when you want an amazing cocktail and an equally amazing meal in a cool setting filled with nice folks working to make you happy. Cheers to that!